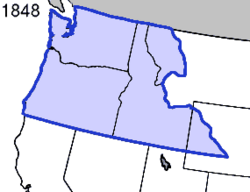 The Oregon boundary dispute (often called the Oregon question) arose as a result of competing British and American claims to the Oregon Country, a region of northwestern North America known also from the British perspective as the Columbia District, a fur-trading division of the Hudson's Bay Company. The region at question lay west of the Continental Divide and between the 42nd Parallel of latitude on the south (the northward limit of New Spain and after 1821 of Mexico) and the 54 degrees, 40 minutes line of latitude (the southward limit of Russian America). This dispute almost brought about another war. 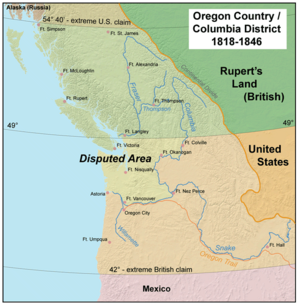 Both the United Kingdom and the United States had territorial and commercial interests in the Oregon country as well as residual claims from treaties with Russia and Spain. By Article III of the Anglo-American Convention of 1818 the United Kingdom and the United States agreed to what has since been described as "joint occupancy," demurring on any resolution of the territorial and treaty issues until a later time. Negotiations over the next few decades failed to settle upon a compromise boundary and the Oregon Dispute became important in geopolitical diplomacy between the British Empire and the new American Republic. In 1844 the U.S. Democratic Party, appealing to expansionist sentiment, asserted that the U.S. had a valid claim to the entire Oregon Country. Democratic presidential candidate James K. Polk won the 1844 election, but then sought a compromise boundary along the 49th parallel, the same boundary proposed by previous U.S. administrations. Negotiations between the U.S. and the British broke down, however, and tensions grew as American expansionists like U.S. Senator Edward Allen Hannegan of Indiana urged Polk to annex the entire Oregon Country up to latitude 54° 40' N, as the Democrats had called for in the election. The turmoil gave rise to slogans like "Fifty-Four Forty or Fight!," often mistakenly associated with the 1844 election, and the catchphrase "Manifest Destiny." The expansionist agenda of Polk and the Democratic Party created the possibility of two different, simultaneous wars, because relations between the United States and Mexico were deteriorating following the annexation of Texas. Just before the outbreak of the war with Mexico, Polk returned to his earlier position on the Oregon boundary and accepted a compromise along the 49th parallel. This agreement was made official in the 1846 Oregon Treaty, and the 49th parallel remains the boundary between the United States and Canada. The dispute arose as a result of competing claims between the United States and the United Kingdom to the Oregon Country, which consisted of what is now the Pacific Northwest of the United States and southern British Columbia, Canada. Both nations claimed the region based on earlier exploration and the "right of discovery"; following long European precedent, both sides recognized only limited sovereign rights of the indigenous population. In 1818, diplomats of the two countries attempted to negotiate a boundary between the rival claims. The Americans suggested dividing the Oregon Country along the 49th parallel, which was the border between the United States and British North America east of the Rocky Mountains. British diplomats wanted a border further south along the Columbia River, so as to maintain the Hudson's Bay Company's control of the lucrative fur trade along that river. As a compromise, the Anglo-American Convention of 1818 (or Treaty of 1818) called for the joint occupation of the region for ten years. As the expiration of the ten-year agreement approached, a second round of negotiations from 1825 to 1827 failed to resolve the issue, and so the joint occupation agreement was renewed, this time with the stipulation that a one-year notice had to be given when either party intended to abrogate the agreement. Early in the 1840s, negotiations that produced the 1842 Webster-Ashburton Treaty (a border settlement in the east) addressed the Oregon question once again. British negotiators still pressed for the Columbia River boundary, which the Americans would not accept since it would deny the U.S. an easily accessible deep water port on the Pacific Ocean, and so no adjustment to the existing agreement was made. By this time, American settlers were steadily pouring into the region along the Oregon Trail, a development that some observers—both British and American—realized would eventually decide the issue. In 1843 John C. Calhoun famously declared that the U.S. government should pursue a policy of "wise and masterly inactivity" in Oregon, letting settlement determine the eventual boundary. Many of Calhoun's fellow Democrats, however, soon began to advocate a more direct approach. At the Democratic National Convention before the 1844 U.S. presidential election, the party platform called for the annexation of Texas and asserted that the United States had a "clear and unquestionable" claim to "the whole" of Oregon and "that no portion of the same ought to be ceded to England or any other power." By informally tying the Oregon dispute to the more controversial Texas debate, the Democrats appealed to both Northern expansionists (who were more adamant about the Oregon boundary) and Southern expansionists (who were more focused on annexing Texas). Democratic candidate James K. Polk went on to win a narrow victory over Whig candidate Henry Clay, in part because Clay had taken a stand against expansion. In his March 1845 inaugural address, President Polk quoted from the party platform, saying that the U.S. title to Oregon was "clear and unquestionable." Tensions grew, with both sides moving to strengthen border fortifications in anticipation of war. Despite Polk's bold language, he was actually prepared to compromise, and had no real desire to go to war over Oregon. He believed that a firm stance would compel the British accept a resolution agreeable to the United States, writing that "the only way to treat John Bull was to look him straight in the eye." But Polk's position on Oregon was not mere posturing: he genuinely believed that the U.S. had a legitimate claim to the entire region. He rejected British offers to settle the dispute through arbitration, fearing that no impartial third party could be found. Prime Minister Robert Peel's foreign secretary]], the Earl of Aberdeen, also had no intention of going to war over a region that was of diminishing economic value to the United Kingdom. Furthermore, the United States was an important trading partner. With the onset of famine in Ireland, the United Kingdom faced a food crisis, and had an increasing need for American wheat. Aberdeen had already decided to accept the U.S. proposal for a boundary along the 49th parallel, and he instructed Richard Pakenham, his minister in the U.S., to keep negotiations open. A complicating factor in the negotiations was the issue of navigation on the Columbia River. Polk's predecessor, John Tyler, had offered the British unrestricted navigation on the river if they would accept a boundary along the 49th parallel. In the summer of 1845, the Polk administration renewed the proposal to divide Oregon along the 49th parallel, but this time without conceding navigation rights. Because this proposal fell short of the Tyler administration's earlier offer, Pakenham rejected the offer without first contacting London. Offended, Polk officially withdrew the proposal on August 30, 1845, and broke off negotiations. Aberdeen censured Pakenham for this diplomatic blunder, and attempted to renew the dialogue. By then, however, Polk was suspicious of British intentions, and under increasing political pressure not to compromise. He declined to reopen negotiations. Senator Lewis Cass was a leading advocate of 54° 40', but backed away from the claim when it became untenable. Like James Buchanan, Cass had presidential ambitions and did not want to alienate Americans on either side of the Oregon question. Meanwhile, many newspaper editors in the United States clamored for Polk to claim the entire region as the Democrats had proposed in the 1844 campaign. Headlines like "The Whole of Oregon or None" appeared in the press by November 1845. In a column in the New York Morning News , editor John L. O'Sullivan argued that the United States should claim all of Oregon "by the right of our manifest destiny to overspread and to possess the whole of the continent." Soon afterwards, the term "Manifest Destiny" became a standard phrase for expansionists, and a permanent part of the American lexicon. O'Sullivan's version of "Manifest Destiny" was not a call for war, but such calls were soon forthcoming. In his annual address to Congress on December 2, 1845, Polk recommended giving the British the required one-year notice of the termination of the joint occupation agreement. 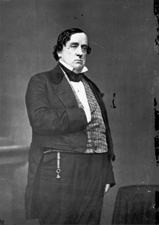 In Congress, Democratic expansionists from the Midwest, led by Senators Lewis Cass of Michigan, Edward A. Hannegan of Indiana, and William Allen of Ohio, called for war with the United Kingdom rather than accepting anything short of all of Oregon up to 54° 40' N (54° 40' was then the southern boundary of the Russian claim to Alaska). The slogan "Fifty-Four Forty or Fight" appeared by January 1846, driven in part by the Democratic press. The phrase is frequently misidentified as a campaign slogan from the election of 1844, even in many textbooks. The calls to war were fueled by a number of factors, including traditional distrust of the British and a belief that the U.S. had the better claim and would make better use of the land. Moderates warned that the U.S. could not win a war against the world's greatest power, and that negotiation could still achieve U.S. territorial goals. Although the debate in the U.S. was not strictly divided along party or sectional lines, many who clamored for the 54° 40' border were Northerners upset that Polk (a Southern slave owner) had been uncompromising in his pursuit of Texas (a cause deemed favorable to Southern slave owners), but willing to compromise on Oregon. Although Polk had called on Congress in December 1845 to pass a resolution notifying the British of the termination of joint occupancy agreement, it was not until April 1846 that both houses complied. The passage was delayed (especially in the Senate) by contentious debate, and ultimately a mild resolution was approved, the text of which called on both governments to settle the matter amicably. By a large margin, moderation had won out over calls for war. The Polk administration then made it known that the British government should offer terms to settle the issue. Time was of the essence, because it was well known that the Peel government would fall with the impending repeal of the corn laws in the United Kingdom, and then negotiations would have to begin again with a new ministry. Aberdeen and Louis McLane, the American minister in the United Kingdom, quickly worked out a compromise and sent it to the United States. There, Pakenham and the U.S. secretary of state, James Buchanan, drew up a formal treaty, known as the Oregon Treaty, which was ratified by the Senate on June 18, 1846, by a vote of 41–14. The border was set at the 49th parallel, the original U.S. proposal, with navigation rights on the Columbia River granted to British subjects living in the area. Senator William Allen, one of the most outspoken advocates of the 54° 40' claim, felt betrayed by Polk and resigned his chairmanship of the Foreign Relations Committee. The terms of the Oregon Treaty were essentially the same ones that had been rejected by the British two and a half years earlier, and thus represented a diplomatic victory for Polk. However, Polk has often been criticized for his handling of the Oregon question. Historian Sam W. Haynes characterizes Polk's policy as "brinkmanship" which "brought the United States perilously close to a needless and potentially disastrous conflict. "Present Presidential Position" from HarpWeek. "Ultimatum on the Oregon Question" from HarpWeek. "War! or No War!" from HarpWeek. This page was last modified on 3 January 2019, at 22:03.